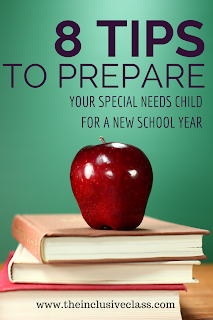 Children with special needs require extra attention during the shift from one school year to the next. A change in environment or routine can be disruptive. Without proper planning, adjustment to a new school year can be challenging. When a significant change is about to take place for a special needs child, schools will often set up a transition plan. A transition plan is designed to help ease the student into a new situation. It is important for parents to know that they can also help transition their child into a new school year. More importantly, parents should begin preparing their child for the new school year before the old one is over! Preparation and support can continue through the school break, right up until the first day back to school. This strategy is known as “front-loading”. By “front-loading”, you are giving your child information and skills in order to make an experience or activity as successful as possible. Ask if any of your child’s friends will be in the same class. A parent can prepare their special needs child for a new school year by providing appropriate information, skills and strategies. This will help ensure that transitioning into a new class will be a positive experience! Great tips. Thanks for sharing. I shared it with my readers. Great information, i think such tips are needed to share a lot to create awareness among people how to treat special kids and how to handle them.